Being able to fly is something we've all imagined doing since we were kids. There's just something magical about it. It symbolizes what we admire most in life; independence, travel, freedom, adventure, and excitement. Flying is probably the most popular activity among lucid dreamers for good reason. 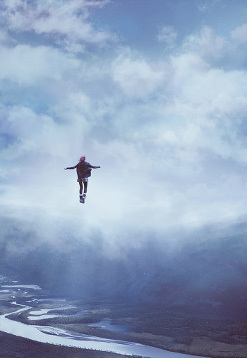 Whether we are traveling across a dreamscape, evading danger, or going for a joyride; flying in lucid dreams satisfies pleasures that waking life simply cannot. Unlike real life where most skills require both mental and physical ability, lucid dreaming only requires the mental aspect. It's literally "mind over matter". Therefore, if you fully believe you can fly...you can. Do I believe it's possible to fly in my dreams? Am I afraid of falling? Am I scared to fly? Release any resistance, reassure yourself, and imagine yourself successfully flying. Hover/Float. Realize that there is no gravity in your dream and begin to slowly lift off the ground. Hover a few feet up until you feel ready to move on. If you have a fear of falling, this is a good first step. Bounding. Imagine you are running on the Moon or a planet that has less gravity than Earth. 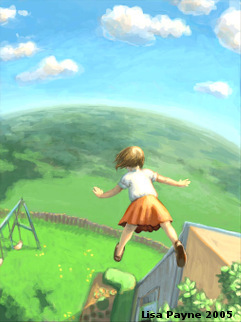 With each step you are able to leap a little higher and farther through the air. Within 10 steps you are able to leap over a building. Imagine wings. Grow a pair of feathery wings as if you were an angel or a bird, or transform your arms into mechanical wings like an airplane. Flapping and gliding are naturally associated with flying and can help you connect with the sky. Swimming motion. Imagine that the sky is as dense as water. Move your arms as if you were swimming through the air; freestyle, breaststroke, or backstroke...whatever works for you. Superman-style. This my preferred method. Put one or both arms out in front as you pierce through the sky. Use an object. If you still find it hard to fly, try hopping on a broomstick like Harry Potter, a magic carpet like Aladdin, or a jetpack/suit like Iron Man. Get creative! This is a dream, remember! There are sooo many different ways to fly. For example: Grab onto a bird as it takes off, put E.T. in your bicycle basket as you pedal through the sky, or turn off the "switch" to gravity. Q: My flying only lasts a few seconds before I wake up. How do I make it last longer? A: This problem is very common. It's actually a result of getting too excited. 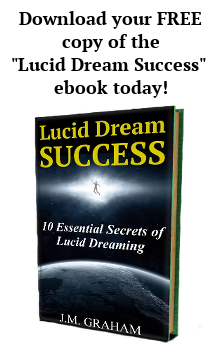 Learn how to stay calm and prolong your lucid dreams. Q: I start to fly in lucid dreams, but find myself slowly sinking back to the ground like a deflating balloon. How do I stop this? A: If you find that you can't fly very well, it might be a problem of having only partial lucidity. In order to fly with full control you must increase your level of lucidity. Do this by concentrating on your hands until everything snaps into crystal clear focus. Q: Even though it's a dream, I'm still scared that I'll fall from a great height. How do I get past this fear? A: Realize that there is actually no law of gravity in the dream world. You may perceive gravity in your dreams, but that is simply a construct of your mind. If it helps, tell dream version of Isaac Newton to shove that apple "up" his you-know-what! Copyright © 2013-2014 Gateway to Lucid Dreaming. All Rights Reserved.